Judy Waters started her career as a hairdresser and was always inspired by colour and shape. It seemed only natural for Judy to follow that path into her artistic endeavour. 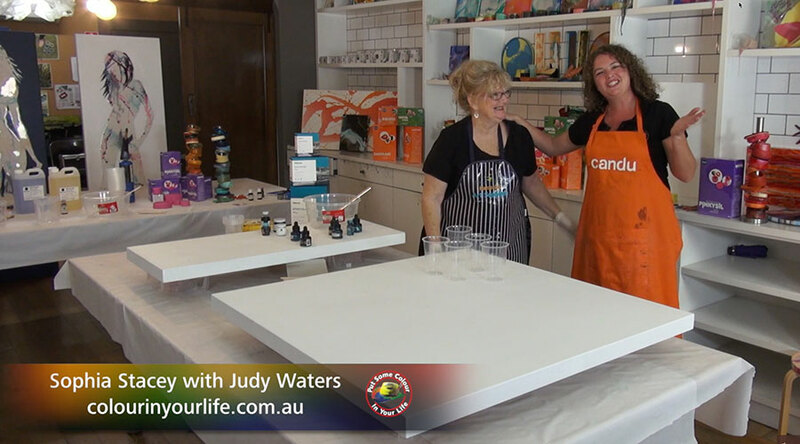 Judy’s first passion was watercolour, which was greatly influenced as she grew up on the Mornington Peninsula, Victoria and was surrounded by the beauty of that coastal region. You can see many of her paintings have a nautical theme. Watercolour as a medium was very successful for Judy, most of which have been sold through galleries, exhibitions and art shows. After approximately 10 years Judy turned her focus to large scale acrylics. Judy felt restricted by the size of a sheet of watercolour paper. Judy Waters loves resin as you have the freedom of movement and the vibrancy of colour that can be combined to create a beautiful art piece which is only restricted by your imagination. In February of last year Judy was given the opportunity to buy Hampton Art Supplies, which is a small art shop, where she has been working for the past 4 years. In the shop which is staffed by like minded artists the team there encourage the customers to try first hand how each product can be used. Judy encourages their artists to extend themselves and not to be afraid to try something new. Judy has a passion for art in all its forms. Judy believes art is as something that can take you on a wonderful journey.